Canada really supports gay rights. I hear 1 million show up for the gay pride parade in Toronto. An estimated 600,000 here in Vancouver, just 50 miles north of Bellingham, WA. where I live. Within bicycling distance so I bicycled up, like I did last year. I attended the parade and also explored some Vancouver bike paths and neighborhoods. Even took a trip out to the mountain area called Pitt River and Golden Ears. Friday to Monday adventure. See my pictures on Flickr, but here are some appetizers. 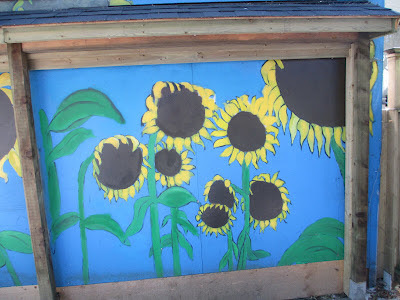 Treasures one finds when traveling slow, like these sunflowers painted on a garage door. 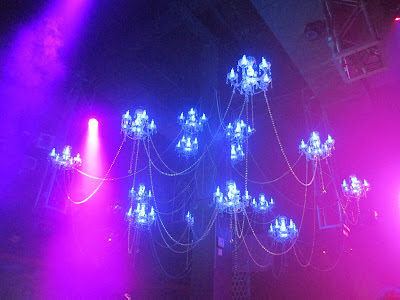 Dancing at Celebrities was quite a trip after the pride parade. The floor was undulating to the music. 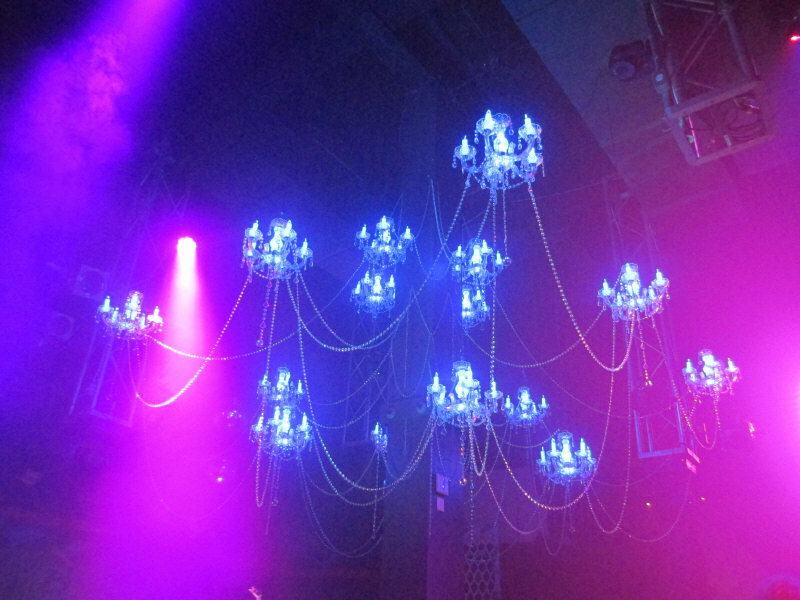 Crowds, lasers, strippers, music; it all comes at the senses. My ears were ringing for several hours after venturing in there, but it was quite exciting. Parade ended at English Bay where one can see festival grounds dwarfed by nearby buildings and mountains. 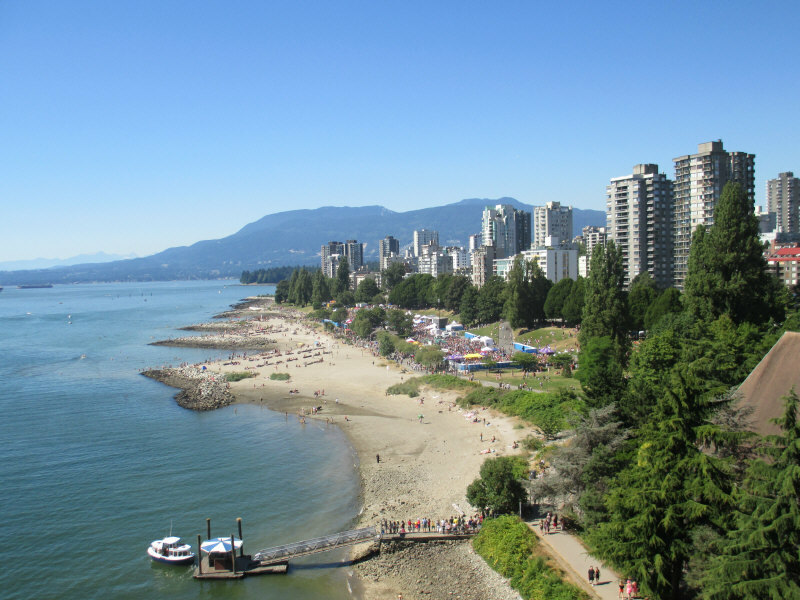 Vancouver has a dramatic setting, also a fairly strong economy due (I'd say) to "blue state style" economics. Innovation and responsible banking. Also good balance between public sector and private sector, rather than the two always fighting like they seem to do in the US. Canadians don't tend to view their public sector as evil. It also helps to have a lot of natural resources that haven't yet been depleted. Oil, gas, coal, timber, hydro power. Housing is expensive, but the economy is fairly strong and Canada has fairly good social safety net. We feel some of Vancouver's economic strength with cross border retail traffic in Bellingham. Some conservatives say that's because Canadians are shopping south of the border to avoid taxes, but Washington State has pretty high sales tax also. Some of it is that, but also we feel the strength of living near the powerhouse that is Vancouver Metro. Traffic at Bellingham International Airport has nearly doubled recently as our airport is kind of becoming Vancouver's second airport. 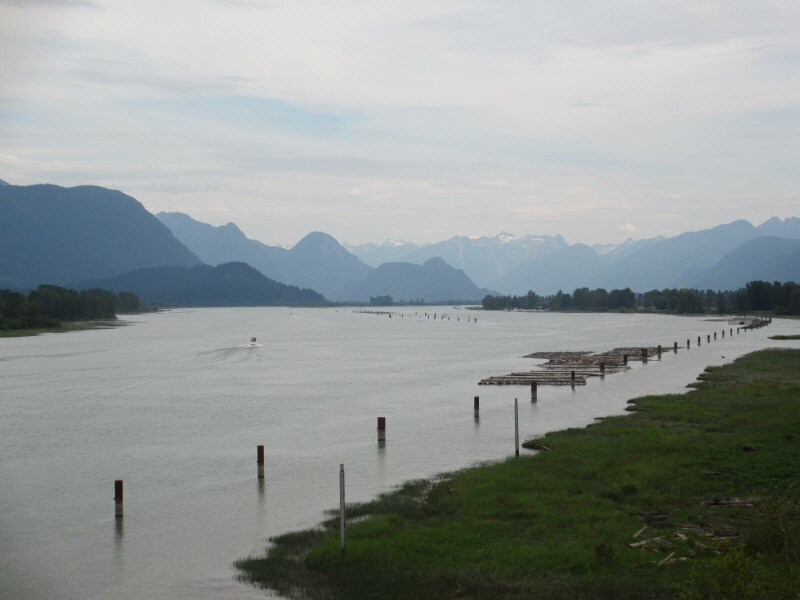 In contrast to the atmosphere at Celebrities, a quiet ride along Pitt River bike paths near the Golden Ears mountain area. I like contrasts. Keeps life varied. 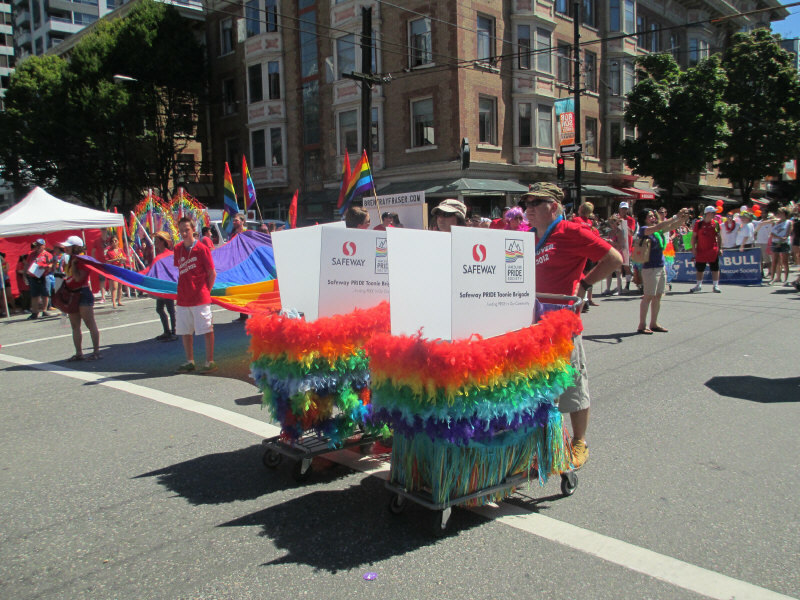 Rainbow shopping carts from Canada Safeway supermarkets in the parade. Festival enjoys sponsorship from many large corporations like Safeway and Toronto Dominion Bank. Riding through Whatcom County and into BC, the air was delicious. 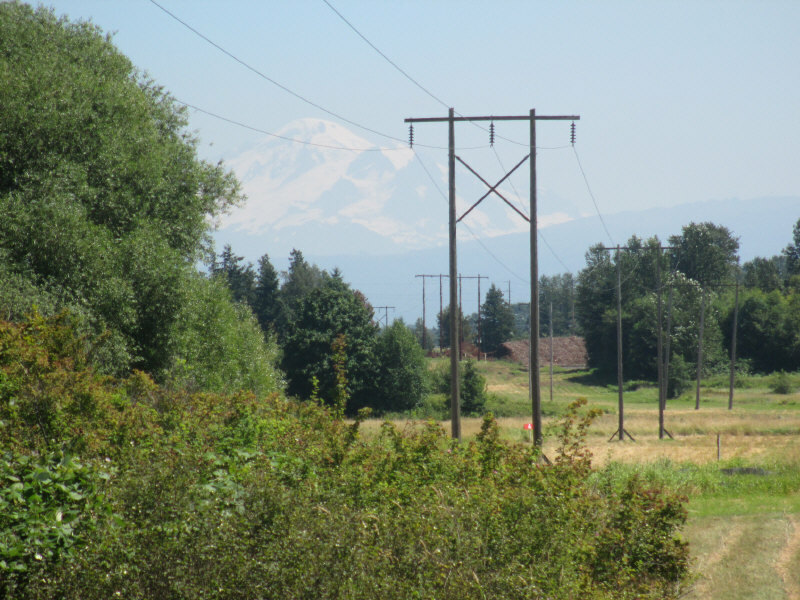 Mount Baker was out in full as viewed from Slater Road. Great stuff. Luv the view of Baker.